Flight B6-324: Struck by lightning after departure, returned and landed without incident. 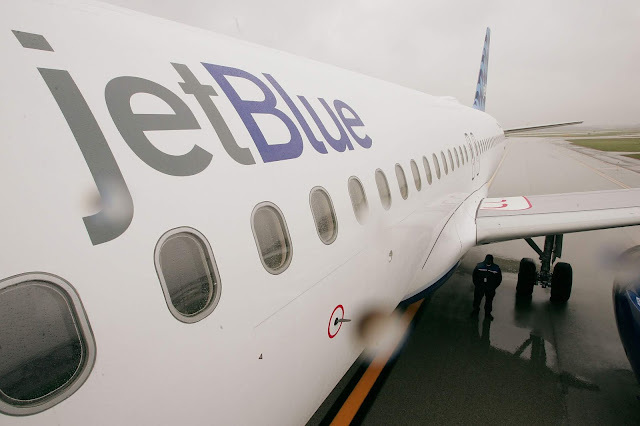 LOS ANGELES (CBSLA) – A JetBlue flight headed to New York was forced to reverse course and make an emergency landing after being struck by lightning just after takeoff from Los Angeles International Airport Thursday morning amid a thunderstorm which pummeled the Southland. JetBlue Flight No. 324 bound for John F. Kennedy International Airport was forced to turn around and return to LAX after its crew reported the aircraft had been hit by lightning, the Federal Aviation Administration confirmed. An LAX spokesperson told CBS2 that the plane — which had 153 people aboard and 36,000 pounds of fuel — safely landed a little after 11 a.m. There was no word of any injuries. According to FlightAware, the plane had taken off at 10:10 a.m. and was only airborne for about 55 minutes. “Hopefully, lightning doesn’t strike twice,” he added. JetBlue confirmed the incident in its own statement. “Crews will inspect the aircraft and determine if it may continue on to New York or if customers will be accommodated on another aircraft,” JetBlue wrote. The plane was still parked at LAX as of 2 p.m. Meanwhile, a second passenger jet out of LAX was also struck by lightning Thursday morning. A Southwest Airlines flight from LAX to Portland was forced to make an emergency landing in Oakland. No injuries were reported in that incident as well.